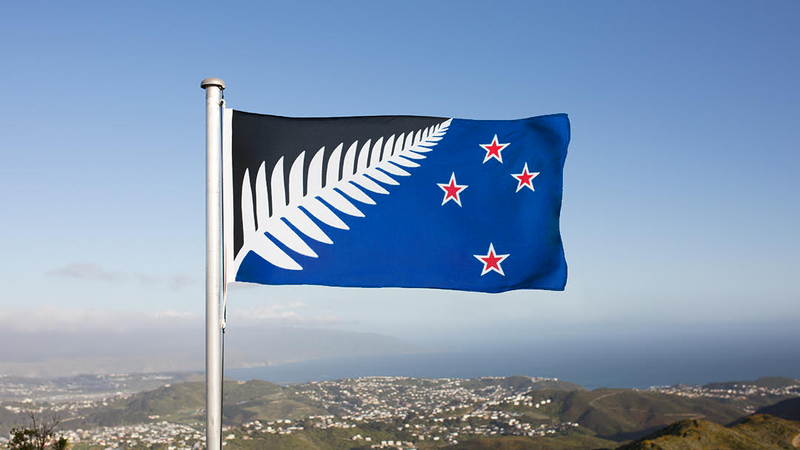 ​Black represents our past achievements and the pride and strength of New Zealand, The bright blue represents our clear atmosphere and the Pacific Ocean, over which all New Zealanders, or their ancestors, crossed to get here, white represents peace, and Aotearoa – land of the long white cloud. The red Southern Cross represents the main island groups of NZ, our shared Māori and Pākehā heritage, and our geographic location in the antipodes. It has been used as a navigational aid for centuries and it helped guide early settlers to our islands. The dominant feature of this flag is a white fern frond that sweeps up diagonally from the bottom left corner to the right of the top centre. The left side of the fern is sitting on a black background. To the right of the fern there are four stars in the formation of the Southern Cross constellation, sitting on a blue background. Each star is red with a white border, and has five points. This is the Silver Fern Flag, voted by the people of New Zealand in the world's first-ever national flag referendum as the official Preferred Alternative New Zealand Flag. Black is one of New Zealand's most well known national colours. Black has been a gazetted official NZ colour since 1975, along with red and white, and the colour blue features on our official coat of arms and of course our present flag which was made official in 1902. The bright blue, representing the pacific, and our clear skies, along with the traditional NZ southern cross in red, gives this proposed national flag the required vibrancy, that a silver fern on an entirely black background can not achieve, and by incorporating the southern cross, and colours from our present flag, the design also honours our history. > All Polls taken since June 2015 have featured the Black White and Blue variant as the winning flag, polls before that time had the Red White and Blue variant as winner.